On September 10, the Guatemalan Constitutional court ordered the suspension of licenses for the construction of the Vega I and Vega II hydroelectric projects in the Ixil territory. The court made the order following the failure of the company to consult the indigenous communities prior to the issuing of permits for the project owned by the Spanish firm Hidroxil, S.A. The two hydro projects were initially approved in 2011, and would have affected the Xamalá and Sumalá Rivers in the municipality of Santa Maria Nebaj. Indigenous authorities had first issued filed the cases against the hydro projects in 2012. The authority had requested that the court annul Agreement 99-2011, which was signed during the administration of Álvaro Colom in 2011, and allowed the Spanish firm to construct the Vega project. The community leaders were troubled by the firm’s lack of respect for the community’s rights upon arrival. Community leaders from the Ixil communities have celebrated this court’s decision. The communities’ right to prior consultation comes from space opened for Guatemala’s indigenous communities to exercise their cultures and rights following the end of Guatemala’s 36-year-long internal armed conflict at the end of the 20th century, which especially hit the indigenous Mayan hard in the highlands of Guatemala. Following the war, the UN backed Truth Commission declared the violence against indigenous communities a genocide. This new space for indigenous rights included the signing of the International Labor Organization’s Convention 169 on the Rights of Indigenous and Tribal Peoples, in 1997, the same year that Guatemala changed the mining laws. This accord requires governments and transnational companies to consult and get the consent of indigenous communities on projects prior to the implementation of the projects. Articles 6 and 7 of the ILO’s Convention 169 especially support the right of indigenous communities to consultation prior to the imposing of any projects. Furthermore, Articles of the Guatemalan Constitution were added to support international conventions like the ILO’s 169. Articles 60-66 of the Guatemalan Constitution all guarantee the rights of the indigenous populations to their land, and to prior consultation. But despite these laws and conventions, indigenous communities and social systems are never respected. But despite these conventions, and articles of the constitutions, companies and the state have generally failed to follow through on their obligation to consult communities, in good faith, prior to beginning any operations or projects in their territories. Communities and their supporters have pressured the courts to respect these laws. This has led to the stoppage of many controversial projects, including the August 2015 decision from the Constitutional Court to suspend the license for the construction of the controversial Xalala dam over accusations of corruption and the failure to consult affected Q’eqchi’ Mayan communities. The victories have also come against mining activities across Guatemala. On November 11, the court suspended the license for the expansion of the mining firm Mayaníquel’s projects into the department of Alta Verapaz. The order affects the company’s Sechol nickel mine in between the municipalities Senahú and Panzós. The order comes after lawyers from the Centro de Acción Legal-Ambiental y Social de Guatemala (CALAS) challenged the project over concerns of the environmental impact. Unfortunately for the communities, these victories come up against the World Bank and Inter-American Development Banks’ planned expansion of Guatemala’s energy production capability. The Inter-American Development Bank has called for the doubling of energy production from Guatemala by the 2027. These calls come as a part of the regional energy market that was established in 2006 following the implementation of Plan Mesoamerica and the Central American Free Trade Agreement. The expansion of energy production comes as part of the construction of the regional market of energy, which stretches from Southern Mexico to Panama. The project includes the integration of the electric grids of Central America as part of the privately owned Central American Electrical Interconnection System (SEIPAC). In order to expand production of energy, the Guatemalan government and the Ministry of the Economy have looked to attract investment in the energy production sector. Investments have come in from corporations from across the world, including from firms such as Duke Energy, which owns a series of electrical plants in the departments of Guatemala and Esquintla. These were purchased in the late 90’s following the privatization of energy generation following the end of Guatemala’s 36-year-long internal armed conflict. The expansion of energy production has relied heavily on the expansion of hydroelectric production across the country, as well as the expansion of geothermal production. Currently there are over 300 permits for the construction of projects to generate energy in Guatemala. Plan Mesoamerica designated Guatemala as the country to take the lead of energy production in Mesoamerica. The governments and international banks, such as the Inter-American Development Bank designated Guatemala as the energy producer due to the vast networks of rivers and bodies of water that flow throughout the country. But this expansion of energy production has brought the transnational governments into conflict with the indigenous communities, who have worked in the years since the end of the war to recuperate their land and identities. The failure of the Guatemalan government and the transnational companies to consult impacted populations prior to the issuing of licenses has led communities to take the consultation into their own hands. Since 2005, 77 consultations at the municipal level have been held across Guatemala, with residents overwhelmingly rejecting mining and mega-projects within their territory. On October 18, voters of the rural community of Zunil, in the department of Quetzaltenango went to the polls to vote on something other than the presidential election. The nearly 7000 residents were participating in a municipal wide referendum on the extractive projects in their communities. Zunil continues the trend of communities’ direct democracy to reject extractive projects in their territory. The green valley at the foot of the Santa Maria volcano in the department of Quetzaltenango is famous for its natural hot springs that flow from the volcanically active earth. But recently, the region has attracted the interest of transnational mining firms interested in exploring the region for mineral resources, as well as the possibility of the generation of geothermal energy and hydroelectric production. In Zunil, over 5500 people participated, with 5432 people voting against any mining projects in their community. Cheers and applause met the announcement of the results, and organizers celebrated the high voter turnout. The results of the Municipal consultation in Zunil will go into the official record, and be officially recognized by the Guatemalan government. The consulta in Zunil is different than many other community referendums held across Guatemala, due to the fact that the Municipal authority organized it. Due to the fact that the Municipality organized the consulta, the results will go into the official public record, and will continue the trend of municipalities officially declaring their territory as mining-free zones. These recent victories in Guatemala’s courts against the extractive industries have not come without costs. 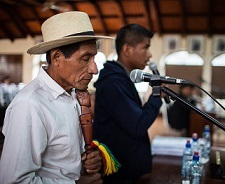 On September 11, the day following the Constitutional Court’s decision, the body of Sebastian Sajic Córdova, a 70 year-old spiritual guide, community leader, and survivor of the genocide against the Mayan people, was found along a trail in the municipality of Cotzal. He had been beaten to death with a cane, and left along the side of the trail. Neighbors reportedly had seen the elderly leader pass by early in the morning on September 11. They also reported that he was being followed by at least two assailants. His body was found at around 6:30 AM. Following the murder, Gabriel Cruz Gomez, a 20 year-old local resident, was arrested by the Guatemalan National Civilian Police, and placed in prison pending an investigation. Guatemala’s news outlets reported that Cruz Gomez had carried out the crime due to a conflict within the family. But residents and members of the Ixil Indigenous Authority contest these claims. They point out that many people who were unaware of what was happening in the courts. Sajic Córdova had testified against former dictator, General Efrain Rios Montt, in the historic genocide case against former dictator in 2013. 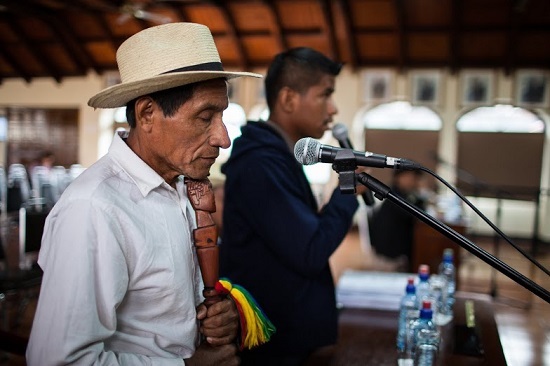 This connection has brought many in the Ixil communities to suspect that his assassination may be a warning to the communities as they continue to seek justice for the genocide, and for the continued violation of the indigenous community’s rights, in Guatemala’s courts. The Indigenous Authority has faced increased threats and aggressions. On August 31, just weeks prior to the assassination of Sajic Córdova, the offices of the Indigenous Authorities in Cotzal were ransacked, leading to the left of 5 computers. The Public Ministry is currently investigating this attack. For the communities and the people who knew Sajic Córdova , they will remember a man who fought and defended the rights of his people, and dedicated himself to the recuperation of the Mayan spirituality. Neighbors reportedly had seen the elderly leader pass by early in the morning on September 11. They also reported that he was being followed by at least two assailants. His body was found at around 6:30 AM..